Administrator’s Note: This is the third article in the series about Manta Sandy’s Monitoring Post. If you wish to read those articles click here, (first article), (second article). With a brand-new Manta Season almost upon us, these graceful ballerinas of the sea are slowly returning to the Dampier Strait region; an area officially designated as Marine Protected Area (MPA) in 2006. Where the mantas have been the past 6 months is still one of nature’s mysteries (and perhaps one best kept! ); but from the months of October through to May these majestic creatures grace the local waters of the Dampier Strait. Raja Ampat is one of the few locations on Earth, where both species of Manta Rays, Mobula alfredi – reef mantas, and the oceanic mantas, Mobula birostris, can be sighted, on occasion even at the same dive site. Relatively easy to find, Manta Rays are a huge drawcard for tourism, with high numbers of tourists visiting the area each year to dive and snorkel amongst one of the world’s most spectacular marine species. 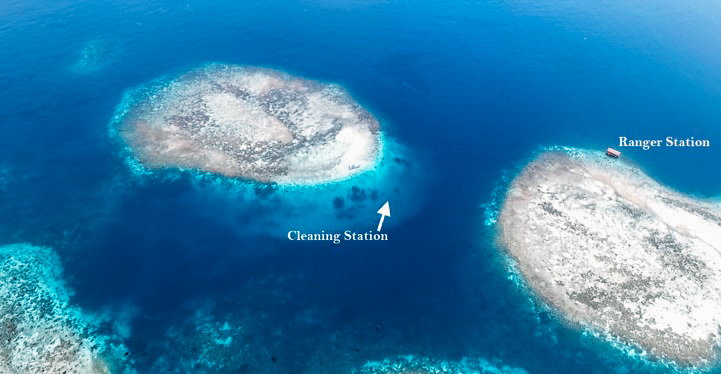 Manta Sandy is a popular, well-known Manta Ray cleaning station in the Dampier Strait region. Known for its regular sightings of mantas during the season, it is an easy but small dive site accessible for all snorkelers and divers, and subsequently it has become a ‘must dive’ dive site for all operators. However, this high and ever-increasing level of human traffic can see up to 9 boats drop up to 50 divers at a time at the site. Whilst some effort has been made to moderate diver behaviour (a “do not cross” rubble line in the sand) this moderation is not always adhered to, nor enforced. Poor diver and/or operator behaviour such as entering the cleaning station, or dropping divers on top of the cleaning station, as well as the sheer volume of divers and boat traffic has, unfortunately, had a direct impact upon the number of mantas aggregating at the site. In an effort to address this issue, a community-based Monitoring Station has been established at the site. A project principally lead by Conservation International (CI) Indonesia, Raja Ampat MPA Network Management Unit, Raja Ampat’s Tourism Agency and Raja Ampat SEA Centre, in close collaboration with local village heads, Papua Explorers Resort, Papua Diving, Marine Megafauna Foundation, Raja4Divers Resort, Raja Ampat Biodiversity Eco Resort, Jaringan Kapal Rekreasi or JANGKAR (association of recreational vessel operating in Raja Ampat, ed.) and local homestays, this Stakeholder project primarily aims to increase tourism regulations on the site, in order to minimise the impact of tourism on the mantas and the nearby reef environment. Currently operational, the Monitoring Station was officially inaugurated during the Raja Ampat’s Maritime Festival, which commenced on October 18th, 2017. 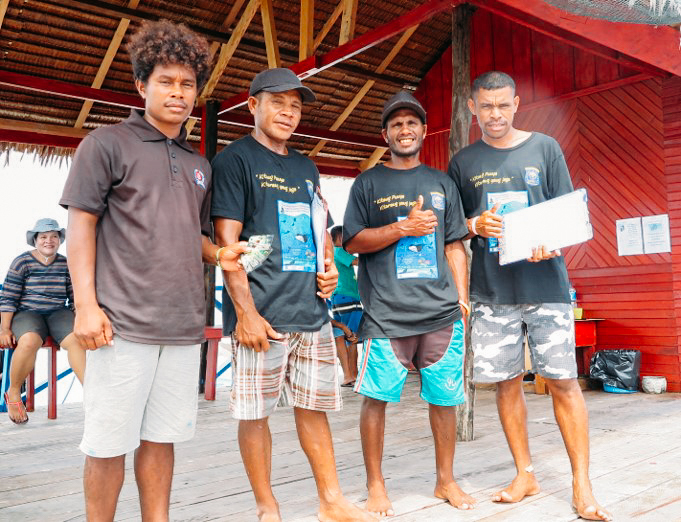 The Station will be manned by 4 Officers from local villages who receive salaries derived from Marine Park Tags (officially named Environmental Service Fee), managed by the Raja Ampat MPA Network Management Unit. Establish a clear and enforceable Code of Conduct for Human-Manta interaction. The Manta Sandy Monitoring Station will also serve as a checkpoint for Marine Park Tags: every visitor to the site will be required to show their tag to the Officers, with regulation in place for those found without a valid tag. All operators accessing Manta Sandy will be required to report to the Monitoring Station on arrival, follow the Standard Operational Procedure, then dive/snorkel the site as per the official Code of Conduct. 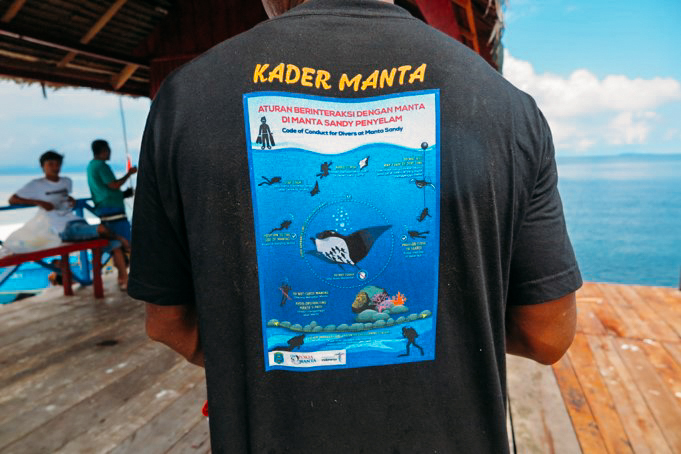 This regulation will help ensure that tourism around the site is kept sustainable and the impact on manta behavior and aggregations minimised, whilst still offering visitors a wonderful opportunity to view the Manta Rays cleaning and feeding. The Monitoring Station is the first of its kind within Indonesia, with its united and collaborative approach amongst all stakeholders. An effort like this is in line with the development of sustainable tourism in the region; where the environment is protected whilst still offering an enhanced tourism experience, and the local community is directly involved and receiving benefit from such a project. The full Standard Operating Procedure (for operators) and Code of Conduct (for divers and snorkelers) can be found HERE. We wish all the Monitoring Station Officers well for their first full season, and invite the cooperation of all operators and visitors to the Site in order to ensure its success. Lynn Lawrance is Co-Founder of Raja Ampat SEA Centre, a BHS Partner. She is also Guest Relations Manager for Papua Explorers Resort, Raja Ampat SEA Centre’s home base. Nikka Amanda Gunadharma is the West Papua Communication & Outreach Coordinator for Conservation International, Indonesia.